While checking out NYmag.com’s Grub Street, I came across a post about famed Meatpacking restaurant STK commemorating McDonald’s 40th anniversary of the Big Mac. Evidently chef Todd Mark Miller is serving up what he calls "Mini-Big Mac’s," which will consist of two mini-burgers made with Wagyu beef, goat cheese, fresh truffles, house made pickles, "special sauce," ketchup, mayo, shallots, chives, lemon juice and truffle oil all on a grilled sesame-seed bun. With the exception of mayo and ketchup, that doesn’t really sound like a Big Mac to me. If they had said "sloppy, yet delicious mess on a sesame-seed bun," then I would have made the connection. In my opinion, some foods should be open for experimentation, but a Big Mac is a classic that shouldn’t be messed with. And if you’re going to pay homage, at least try to keep it close to the original recipe. Big Daddy’s Diner for example, has a monstrous burger they call the "Big MacDaddy" and it is almost exactly the same ingredients as a Big Mac – and quite tasty too. 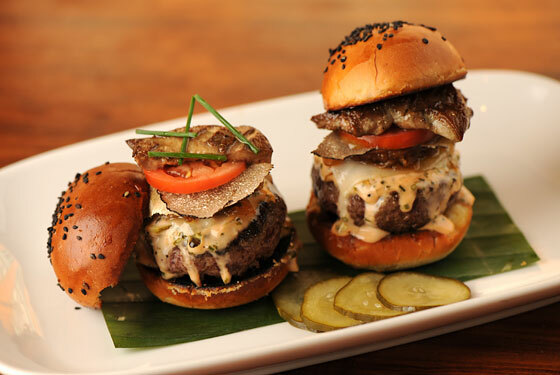 These burgers from STK might taste good, but they wouldn’t provoke thoughts of a Big Mac. I don’t think McDonald’s has even seen the likes of a shallot or a truffle in it’s entire existence, and with good reason. Certain ingredients, like fresh truffles and Wagyu beef, are meant to be savored and indulged, while ground beef "product" and processed cheeses are meant to be scarfed down while no one is watching. These two worlds need not collide. They look good, I can’t lie. But they’re not Big Macs. Someone should alert the Hamburglar. McDonald's Apple Pie to Customers: "Screw You!" This topic is awesome in every way!